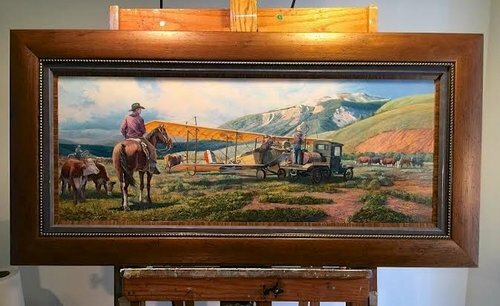 'HORSE OF A DIFFERENT COLOR - A NEW FOUND FREEDOM"
Oil on Panel: 14"x36" Size with Frame: 22"x44"
In the mid to late nineteenth-century, the frontier and its rugged heroes became the protagonists of American lore. Cowboys were popular symbols of freedom across the nation, and their seemingly romantic lives in the West fascinated Americans who were forced to remain in stifling urban centers. As barbed wire enclosed more and more of the open range and true cattle driving cowboys became a rare breed - a new embodiment of freedom landed in the frontier - enclosed more and more of the open range and true cattle driving cowboys became a rare breed in the frontier. In the early 1990s , there was a new symbol of freedom found in aviation. With a newfound dominion over the skies and a legendary lordship of the open range, freedom and its many forms was central to life in the American West.